XCEL-IT supports many of these IT-related programs at SJR State. The XCEL-IT program helps connect students with the resources they need to get started or advance in the IT industry. Services include customized advising, job search assistance and a state-of-the-art computer lab. SJR State offers a broad range of computer science programs and courses using industry standard software and equipment. You can be on your way to a great paying, high-demand career in two years or less! With our hands-on programs and projects, students gain the essential skills and knowledge needed for industry-recognized certifications. SJR State is an authorized Cisco Networking Academy partner. Help Desk Support Technician (4108) C.C.C. 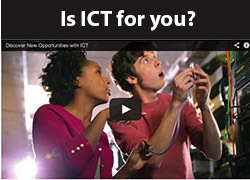 Information Technology Analysis (4131) C.C.C. IT Support Specialist (4109) C.C.C. Mobile Device Technology (4132) C.C.C. Computer Programming Specialist (4120) C.C.C. Information Technology Administration (4115) C.C.C. Web Development Specialist (4112) C.C.C. Computer science professionals are employed in a variety of settings from communications, hospitals, and colleges, to government agencies.